1. 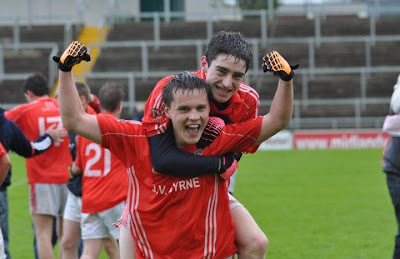 What did it mean to win St Mary's 2nd only Leinster 'A' colleges title? It meant everything in the world after all the hard work and going to training at half 6 in the morning. It meant a lot to everybody. 2. At the start of the year, did you honestly feel that the team could go this far? I felt it could go far but i never thought we would get to croker. 3. In your opinion, who has been your star performing this year? Our star performmer this year has been Danial Grehan. He played brilliant every game and never lets the team down. I'm sure bluey Nolan would tell ya he was the best. Cockiest lad i ever met! 4. Who was your toughest opponent so far in your career? My toughest oppenent was Lorcan Dolan in Kinnegad last year I got a roasting. He's a very good player. 5. Who is the best player you have played with? The best player i have played with would be Danial Flynn, savage footballer and going to go on an play for Kildare for many years to come. He's a beast of a man and he knows it haha. Also is a very big lick-arse. 6. Who is your laziest team-mate? Lyes Djennedi from Carbury has to be the laziest man alive. There is no go in him at all. He's very lazy and has serious talent. 7. What position do you prefer to play? I prefer to play wing back but I also love playin corner back. 8. What has been the highlight of your career so far? The highlight of my career would be winning the leinster been brought on and been part of it meant alot and also winning the championship with Edenderry was great experience. 9. What does it mean to you to play in Croke Park? It's a childhood dream. I still cant believe were getting the opportunity. It will be a great day and hopefully we will be coming home All Ireland champions. 10. What would you like to achieve at club level in your career? I would like to make the senior team and win as many senior titles as possible, and hopefully a minor this year to make up for last years disapointment.